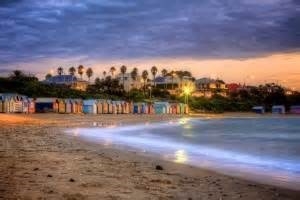 For many years in the late nineteenth century, Brighton was Melbourne's favourite seaside destination. Brighton is located in the City of Bayside, which has 17 km of foreshore to Port Phillip Bay. Nestled on Dendy Street Beach, the Brighton bathing boxes are a popular Bayside icon and cultural asset. Bathing boxes and boatsheds are intrinsic to Port Phillip Bay and Western Port. Much has been written about Victorian morality and its impact on how people went about bathing and enjoying the seashore. As a result of this morality bathing boxes had their origins not only in Australia but concurrently on the beaches of England, France and Italy. European bathing boxes exist to this day. The 82 Brighton bathing boxes are unique because of their uniform scale and proportion, building materials, sentry order alignment and a Planning Scheme Heritage Overlay on a beach owned by Bayside City Council. As simple structures, all retain classic Victorian architectural features with timber framing, weatherboards and corrugated iron roofs. They remain as they did over one hundred years ago, as licensed bathing boxes. No service amenities such as electricity or water are connected. 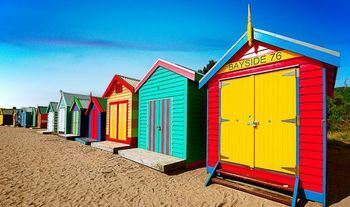 Although approximately 1,860 bathing boxes, boatsheds and similar structures are located around Port Phillip Bay and Western Port, the Brighton bathing boxes are the only remaining structures of their kind close to the Melbourne central business district. As a functional remnant of a bygone era, they provide a cultural and historical resource that is constantly being photographed, painted or drawn.